Idling, I searched The Guardian's website for any mention of the term "crinkle-crankle" and found this Diary of a Garden Designer article by Tom Hoblyn. Truth be told, I was a wee bit confused since he mentioned working at The Oaksmere before I realised that (a) he himself has a wall and (b) he lives in Suffolk. One email exchange later, he was good enough to extend an invitation to come visit him at Bardwell, north-east of Bury. 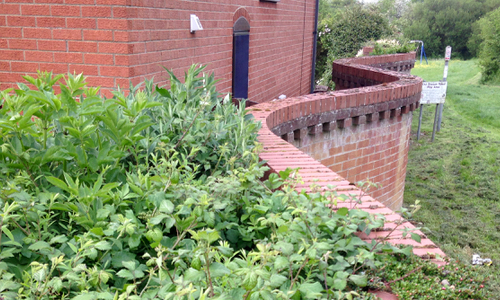 Outside was overgrown when he first came to see it. 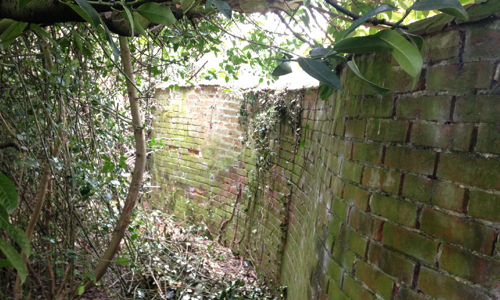 Then he tore off some ivy to reveal the crinkle-crankle wall and realsed that this was most likely a walled kitchen garden, which persuaded him to buy. There's work still to do but the place is now transformed. 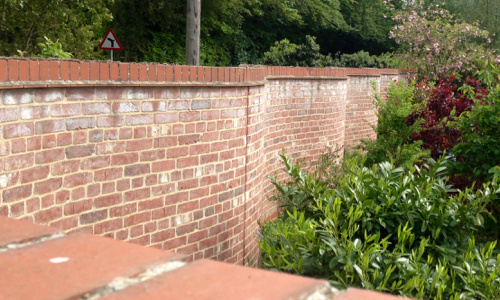 Reminiscent of former times at Rendlesham, Tom now grows peaches, subject to the weather, and has had to do the odd wall repair following removal of a neighbour's leylandii. A little sagging is fine. Curiously, the waviness doesn't extend to the long-ish roadside wall. Any road up, nice wall, nice chap, nice chat. Cheers. My mum, having been assigned the case, dug deep, detected and dialled numbers to uncover The Greens. Come 4pm on Sunday and we're parked in David's driveway. As we see a wavy sliver to the left, I'm thinking, is that it? That's before he directs our attention to the longer stretch to the east. Used to be a kitchen garden for Street Farm, he believes. He shows us the mighty (3m?) straight wall to the north, part of which was repaired a while back when a bus reversed into it, and then we're round the back. Here, he says, is the best-looking bit. And it certainly is, a fine curvy intact length c/w blocked off doorway. Flowerbeds, climbing plants and the odd birdbox combine to transform this curiousity into something homely and fitting. So here we have an unremarkable 70s house surrounded by antique brick walls. It's one of kind and I like it. Big thanks to David and Linda for taking the time and trouble to invite us weirdos round. Two miles SW of Beccles (home to Hungate Lane and Coney Hill) is Ringsfield, notable here for being one of the few original Pevsner entries to mention "undulating forcing walls (crinkle-crankle walls)". Bob Kindred had already told me that this was "mostly hidden behind undergrowth", and he was dead right. Standing in the All Saints churchyard, you wouldn't have an earthly about the curviness of the wall. Obtaining any sort of view requires a clamber over branches and through overhanging thorns. Nonetheless, there it is. Listed Grade II, too, though it's hard to tell what state it's in. A better view can be had by peeking into the garden of the big house next door, showing a decent length with quite a few buttresses. Think it goes all the way to the rectory next door. Most obscured example yet. 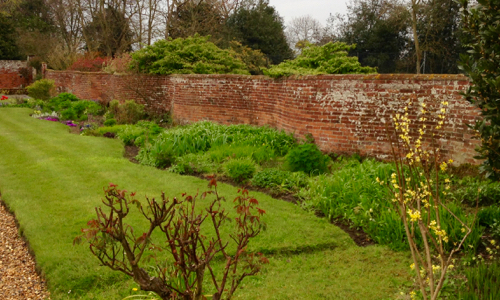 A length of serpentine wall forming the eastern boundary of the rear garden of The White House. Late C18 or early C19. Red brick with brick copings. About 45m long and 1.5m high. We tried a tiny track called Callender Houses and got nowhere, then doubled back by a sign for Laurels Farm. Much more promising, since there was White House Cottage. Down a side path stood a far grander place, presumably the White House itself. Parallel to their tennis court runs all 45m of the wall. And a quick pic from the drive revealed a very well kept garden crammed with herbaceous borders enhancing their rather lush wall. Classy. 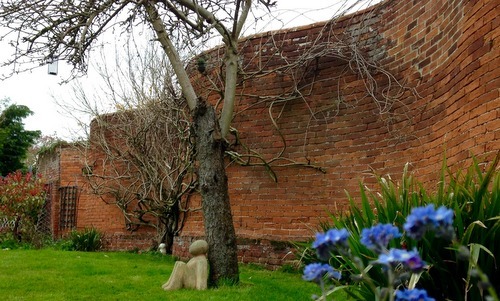 18th-century Crinkle-crankly garden wall at the rear of 54 Earsham Street, about 1.8m high and built with 7 piers. It now has in addition 3 raking brick buttresses on its SW side. Must be something about such properties since, like Sudbury and Hollesley, number 54 is now a residential care home. Turning right to park along Outney Road, we're pointing, 'cos there she blows. Sporting a "Private Car Park" sign, their wall is plain to see from the road. Can't get in to the actual garden since the gate is locked but it's enough to see this from the outside. A shot from above clearly shows the single brick construction and the apparently erratic bend. 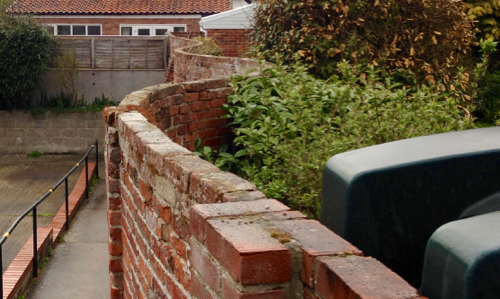 They do like a wavy wall in Waveney. When Eldest drew up her original crinkle-crankle list, number one, due to its mention in the original Suffolk Pevsner, was Henham Hall. Now, I've been to Henham Park many times for Latitude. It's a v-a-s-t private estate. Where's that wall and how to gain access? Mr Google says that Henham (even after 500 years) is still owned and run by the Rous family. Waddya know, the owner is contactable online. I send him a quick email, he responds very positively, then me and Mum are driving over the cattle grid toward the stables. Round the corner and there's Hektor's house. Hektor, Sarah and baby Xa (sp?) 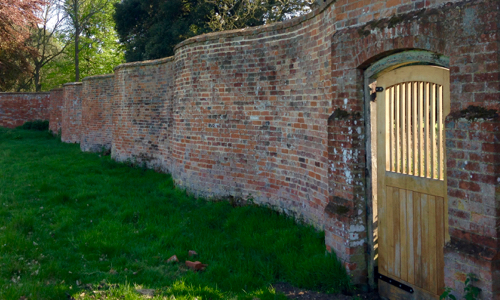 lead us into the walled garden. Think you've got a big garden? Think again, buddy, since this is one of the largest such gardens in Europe. Much careful work has gone into restoring the walls (including custom-made family plaques), three of which are straight with the western boundary a 110m listed serpentine buttress-free beauty. Tall, too. Echoes of Rendlesham abound, what with tales of how overgrown this place used to be and the fact that the actual grand hall is long gone. That sliver of wall beyond the garden is all that remains following its demolition in the 1950s. Amazing place and amazingly gracious of Hektor and family to give us the tour. Previously unknown walls (such as Hollesley) have turned up every now and then thanks to the associated property having come up for sale. Until this week, I'd never thought to ask Mr Google to query the whole Rightmove site. Now the to-do has grown. Cottages themselves are given some privacy from the main road by this brand new wavy wall, around 7ft tall, a lot of which is hidden by greenery. As with all newer developments, hats off to whoever had this idea. Another place found on Rightmove and which has been on the list for yonks is at nearby Darsham. Very much not visible from the public highway, we took our chances, pulled off the A12 into a driveway and knocked at the door of Darsham Cottage. Couple there thought we were in search of the B&B next door but were kind enough to listen to my mad babbling and invite us in. The original hall burned down in the 1980s, apparently, but certain parts remain including a fantastic section of mighty 3m crinkle-crankle adjoining a sumptuous Georgian music room. That was before we were taken through a gate on the other side of the house to view a further section giving some protection to a vegetable garden. What's that in the field beyond the wall? Oh, only some alpacas. Thanks again to our new pals at Darsham for the tour. Third and final serpentine of a long day is another Rightmove find. Off the A12, through Bramfield and here's our good friend Halesworth, already home to a fine example on Rectory Lane. Far north of the town, we find Old Station Road. Wonder what could have been there once upon a time? There's a stretch of grass on one side leading to the factually named Old Station Road Play Area. House to the left hand side has a nifty new crinkle-crankle wall which starts small, near the road, then grows as the ground drops away. Bricks at right-angles to the underlying wall form coping stones along the entire length. Surprisingly pleasing to the eye. 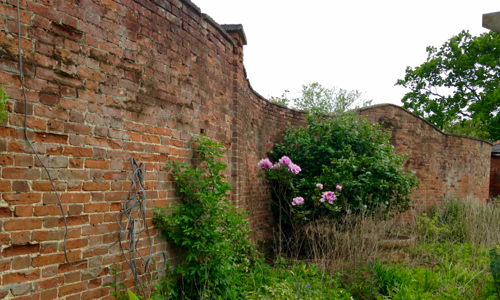 Dr Bettley mentioned that his "Suffolk: East" entry for Kelsale Hall talks of a "kitchen garden to NW with crinkle-crankle wall." We'd previously detoured past here en route to Dunwich, while nearby is Theberton. 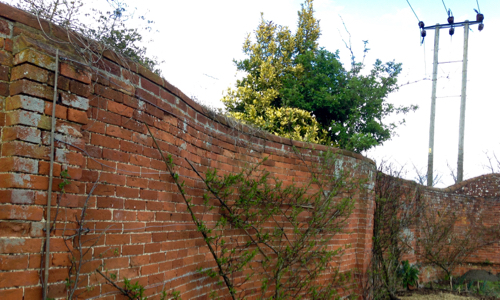 But this is another private garden wall and permission must be sought. Known as By The Crossways at Kelsale, an article in "Suffolk" magazine (isn't this where we came in?) named William and Miranda Kendall as the owners. We exchanged enthusiastic emails and a date was set. Unusually, I was there on time only for the owners to be held up elsewhere. Luckily the gardener (Brian?) was good enough to direct us to the hard-to-miss wall. 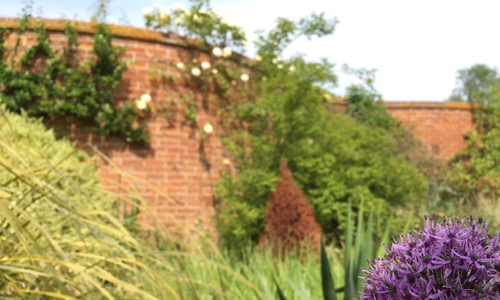 Tall and old and wavy, not as long as some yet longer than others, it provides a home for various specialist plants. On one side is the driveway, on the other a swimming pool. Nice. It didn't seem right to hang around for too long, though I believe the gardens are a sight to behold and are in fact open on 11-Sep-2016 as part of the National Gardens Scheme. I'm planning to go back for my home-made cream tea! Merci, Miranda.